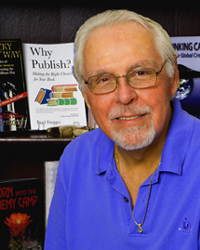 Brad Fregger is the President/CEO of Groundbreaking Press and a sought after speaker by organizations looking for a person who has something to say, and says it in an entertaining and compelling way. His focus tends to be on the concepts discussed in his books. Brad speaks internationally on leadership, team building, negotiation, diversity, and achieving creative environments. In addition, he was a regular contributor to the conservative website, America's Right, where his articles have been commented on and supported by individuals with a broad spectrum of political beliefs. Groundbreaking Press is an author-services book publishing company dedicated to helping authors get their books into publication at the best possible price, while maintaining excellent quality. In addition to working with individual authors, they also work with organizations that want to take advantage of their ability to produce high quality books at an extremely reasonable price. Groundbreaking Productions handles Fregger's speaking and lecturing opportunities. All content, except space images, copyright, 2019, Brad Fregger. Space photos courtesy of NASA.